Dhaulagiri(8,167M) 28°41'45?N 83°29'36?E is the seventh highest mountain in the world. It forms the eastern anchor of the Dhaulagiri Himal, a subrange of the Himalaya in the Dhawalagiri Zone of north central Nepal . It lies northwest of Pokhara, an important regional town and tourist center. Across the deep gorge of the Kali Gandaki to the east lies the Annapurna Himal, home to Annapurna I, one of the other eight-thousanders. Dhaulagiri means "White Mountain". Computations by Lt. William Spencer Webb from surveys started in 1808 indicated that Dhaulagiri was the highest known mountain in the world . This lasted for 30 years before Dhaulagiri's place was taken by Kangchenjunga . In terms of rise above local terrain, Dhaulagiri is, in fact, almost unparalleled in the world. For example, it rises 7000 m over the Kali Gandaki gorge to the southeast in about 30km of horizontal distance. The Kali Gandaki is especially dramatic since Dhaulagiri and Annapurna both stand near the river, giving a unique example of two Eight-thousanders facing each other over a deep valley. The South and West faces of Dhaulagiri both feature massive drops; each rises over 4000 meters from its base, and each has been the site of epic climbs (see the Timeline). Among the subsidiary peaks in the range, Gurja Himal also boasts a large, precipitous drop on its south face. Dhaulagiri was first climbed on May 13 , 1960 by Kurt Diemberger , Peter Diener, Ernst Forrer, Albin Schelbert, Nyima Dorji and Nawang Dorji, members of a Swiss/Austrian expedition. The expedition leader was Max Eiselin; they used the Northeast Ridge route which had been reconnoitered one year earlier by an Austrian expedition led by Fritz Moravec . This was also the first Himalayan climb supported by a fixed-wing aircraft. The aircraft, a Pilatus PC-6 , crashed during the approach and was later abandoned on the mountain. 1950 The peak is reconnoitered by the French, led by Maurice Herzog ; however they do not see a feasible route and switch their objective to Annapurna, where they succeeded in making the first ascent of an 8000 m peak . 1953-1958 Five expeditions attempt the North Face, or "Pear Buttress", route. 1954 J. O. M. Roberts and Sherpa Ang Nyima climb Putha Hiunchuli (the first successful major summit ascent in the range). 1959 An Austrian expedition led by Fritz Moravec makes the first attempt on the Northeast Ridge, which will become the first ascent route the following year. 1960 The first ascent, detailed above. 1969 Americans, led by Boyd Everett, attempt the Southeast Ridge; seven team members, including Everett, are killed. 1973 An American team led by James Morrissey makes the third ascent of Dhaulagiri, via the first ascent route (Northeast Ridge). Summit team: John Roskelley, Louis Reichardt, Nawang Samden. 1975 A Japanese team led by Takashi Amemiya attempts the Southwest Ridge (also known as the South Pillar). Six people are killed in an avalanche. 1976 An Italian expedition makes the fourth ascent of the peak. 1977 An international team led by Reinhold Messner attempts the South Face. 1978, Spring: Amemiya returns with an expedition which puts five members on the summit via the Southwest Ridge; this is the first ascent not to use the Northeast Ridge. One team member is killed during the ascent. 1978, Autumn: Seiko Tanaka of Japan leads an expedition which successfully climbs the very difficult Southeast Ridge. Four team members are killed during the ascent. Also, a French team attempts the Southwest Buttress (also called the South Buttress), but reaches only 7200 m.
1979 A Japanese expedition climbs Dhaulagiri II via the east ridge and Dhaulagiri V via the south ridge. They place camps on the summits of both peaks, and members of the expedition make traverses along the 4 km (2.4 mi) intervening ridge (which is everywhere above 7,150 m) in both directions. This expedition was also notable for being led by a woman, Michiko Takahashi. 1981 A Yugoslavian team reach 7,950 m after putting up the first route on the true South Face of the mountain, on the right side, connecting with the Southeast Ridge. They climbed in alpine style, but suffered four days of open bivouacs and six days without food before returning. Also, Hironobu Kamuro of Japan reaches the summit alone, via the normal route. 1984 Three members of the Czechoslovakian expedition (J. Simon, K. Jakes, J. Stejskal) reached the summit via the monumental west face of the mountain. J. Simon died during the descent. 1985 A Polish expedition including the famed Jerzy Kukuczka climbs Dhaulagiri, via the standard route, in winter: they reach the summit on January 21. 1986 A mostly Polish expedition puts up the second South Face route, on the left side of the face, connecting with the Southwest Ridge route. They go above 7500 m but do not reach the summit. 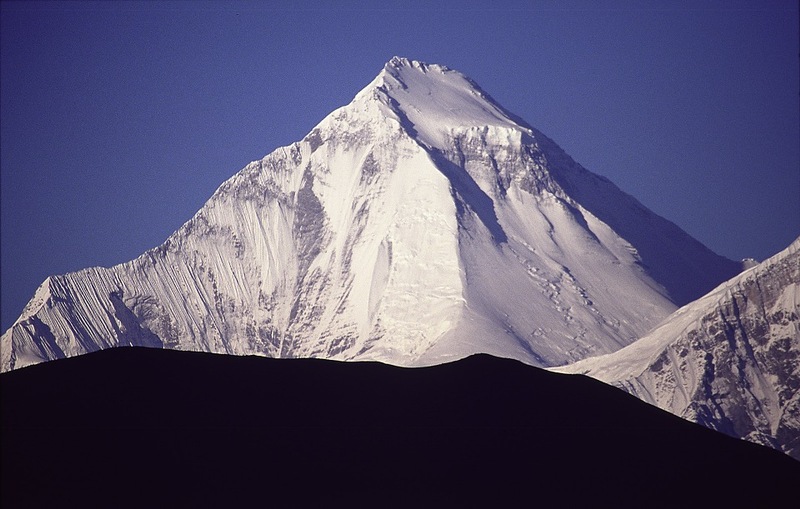 1990 Dhaulagiri becomes the first mountain higher than 8000 m to be climbed by a Lithuanian. The legendary alpinist Dainius Makauskas disappears while coming back from the top. 1993 A Russian-British team puts up the Direct North Face Route. 1998 On May 16 , Chantal Mauduit , an accomplished French climber, dies in an avalanche while attempting Dhaulagiri. 1999 On October 24 Ginette Harrison , an accomplished British climber, dies in an avalanche while attempting Dhaulagiri. Days later, the Slovenian Tomaz Humar climbs the huge, steep South Face solo, but does not reach the true summit of the peak. In this list, only peaks above 7,200 m with more than 500 m (1,640 ft) of topographic prominence are ranked . The status of the three peaks of Churen Himal is unclear, and sources differ on their heights. The coordinates, heights and prominence values above are derived from the Finnmap. The first ascent data is from Neate, but it is unclear if the first ascent of Churen Himal East was actually an ascent of the highest of the three peaks, as Neate lists Churen Himal Central as a 7,320 m subpeak of Churen Himal East. Most of these peaks lie along one high east-west ridge, lying to the west-northwest of Dhaulagiri I and separated from it by a deep col (the French col). In order from west to east, they are: Putha Hiunchuli, Churen Himal, D VI, D IV, D V, D III, D II. Gurja Himal lies south of Dhaulagiri VI, away from the main ridge. 05 April 2009 Day 01: Arrival and transfer to Hotel. • 5 Nights accommodation in Kathmandu with bed & Breakfast (3 star). • Insurance for Nepalese expedition crew.